Streams are naturally dynamic systems with alternating areas of erosion and deposition. This is problematic for properties and structures that are not managed or built to accommodate a stream’s natural tendency to shift its banks within a floodplain. This situation is exacerbated in areas receiving higher than natural runoff from developed lands that tend to produce even more dramatic flood flows and bank erosion. Landowners who want to maintain a stream’s natural values as much as possible while stabilizing a stream course to protect streamside lands from natural bank erosion can employ methods that integrate engineered structures and natural, vegetated bank protection measures. This provides bank protection with wildlife habitat values, and strategic choice of vegetation can further diffuse erosive energy of flood flows. In addition to providing local site protection, a bank stabilization project also reduces the input and movement of sediment in a given waterway downstream, reducing the risk of downstream sediment accumulation and flooding. 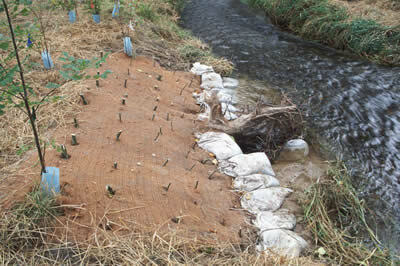 Streambank protection projects are expensive and require state and federal resource agency consultation and permits, so they are typically not advisable unless current or anticipated erosion presents a clear need to prevent loss of land or facilities adjacent to banks; to maintain the flow or storage capacity of the water body; to reduce the offsite or downstream effects of sediment resulting from bank erosion; or to improve or enhance the stream corridor for significant fish and wildlife habitat. Such projects should always be conducted under the direction of a qualified and experienced engineer and in accordance with all applicable local, state, and federal laws and regulations. Protective measures for the existing wildlife and water quality resources must be used to minimize disturbance during construction.